To teach (or review) the history and geography of ancient Greece. This game is multilevel so it can be played by players of diverse ages, abilities and knowledge levels! The board is a large map of Greece (6 pages taped together!). The die does not contain numbers, but rather modes of transportation. 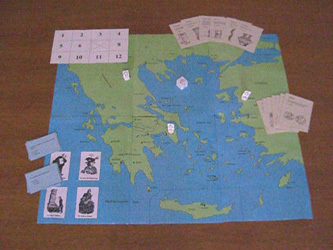 The players pretend to be college students taking a semester abroad in Greece and they use boats, cars, or planes to hop around the country, visiting famous sites and collecting artifacts. When POP QUIZ is rolled on the dice, they must answer a multiple choice question about ancient Greek history. The download contains both a black and white version of the map board and a colorize version. If you simply hit “Print” you will get both versions. Scroll down through the PDF first, check them out then decide which you want to print out.